Students get to demonstrate their creative side with this fun and engaging project. The premise is that scientists have finally achieved the ability to time travel and have decided to go back to the Age of Exploration to interview famous figures. This leads them to bring many of these explorers and monarchs back to the present day. As these historical figures make their way to the 21st century they become amazed at all the new technology available and are especially interested in the invention of motion pictures. 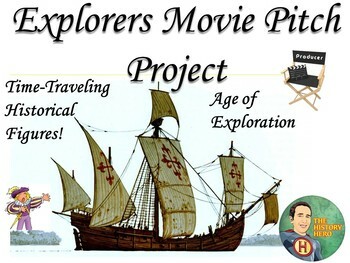 They decide their life story is worthy of a feature film and plan to make a pitch to movie producers on why a film about their lives would be superior to other people connected with the Age of Discover. Students then have the option to create a live-action "pitch" or film a short video, either individually or in groups after researching their historical figure. In a group setting students will have different roles, including the historical figures themselves and their entourage to "hype" them up. Students are also encouraged to include both positive and negative elements of their figure's life, as it would make for a more dramatic and interesting story. Textbooks and electronic resources can be used. Included in your purchase: student handout with detailed directions, student chart to organize research notes, note-taking guide during presentations, explorer/monarch list, electronic resources list, and a script template. On top of all that there is an added bonus: directions for an alternative assignment "Age of Discovery Slideshow" Project. This alternative individual assignment could be helpful for any students who don't work well in groups. If you'd like to receive updates and freebies, make sure to follow my store by clicking the green star near my store name. *Click on "My Purchases" and under each purchase you'll see a button to provide feedback. After clicking on that you will be taken to a page where you can give a quick rating and leave a comment for the product. Your feedback is very much appreciated.